Project teams intuitively talk about milestones. They discuss when phases will be complete and when deliverables will be turned in to the clients. The further away the individuals are from the detail of the project tasks, the more likely they will be focused on the big dates in the project, like clear deadlines or handoffs or dependencies. But these aren’t the only milestones of note on a project. Project milestones are any fixed points in time that are worth flagging to help you keep the project moving forward and best communicate with your team. Proper project management tools and software have ways of defining and demonstrating key project milestones as a way of formalizing these on your project schedule. The conventional icon for displaying a milestone on your project Gantt chart is a diamond. To add one, you simply select the task on your schedule and change the properties to turn it into a milestone. In some tools, you might see the date written next to it. Within your project plans in ProjectManager.com, if you hover over the diamond, you can see the name of the milestone, too. The diamond shape makes it really easy to identify milestones when you are scanning through your project plan. That way you don’t have the check the task duration or go into each task to read the detail. Turning points in the project where you transition to another state or phase. You can link tasks to milestones, too. This is handy when you want to use the milestone at the end of one phase to kick off the start of the next. Just make the milestone the predecessor task of the next one in the series and everything will hang off that. Another great reason to use milestones is that they flag up when the team has achieved something. You’ve completed a phase, or delivered a key part of the project. That’s worth celebrating! Send a short note to the team when you hit a milestone on time, thanking them for their cooperation and work to get you to this point. Little notes like this help build good working relationships within the team and keep morale high while you forge forward. At the end of your project you can use a milestone to point out when you are having your launch party and project closure celebration. It’s something to look forward to and having it marked clearly on your plan will make sure you don’t rush past on to the next project and forget to do it! Milestones are a good way of helping other people understand how your project is moving forward, even if they don’t understand any of the detailed tasks. You can track progress by looking at how many milestones you have hit on time. It’s a basic measure of project status but it’s something that project stakeholders like because they don’t have to look at all the detail on your plan. They can help you manage stakeholders’ expectations by putting them in the schedule at key points – times in the project that they care about, such as sign off of the design brief or the end of testing. Include the milestones achieved this month and the milestones due next month on your project reports or in presentations. It’s also a good idea to highlight whether they were achieved on time, early or late and by how much. This gives everyone a clear idea of whether overall the project is progressing to plan and if not, what the impact has been. It’s unlikely your project sponsor will worry too much over a day but if you have missed your last milestone by a month then it’s time for the Project Board to step in and assess the project’s progress in more detail. So What if I Don’t Like Diamonds? 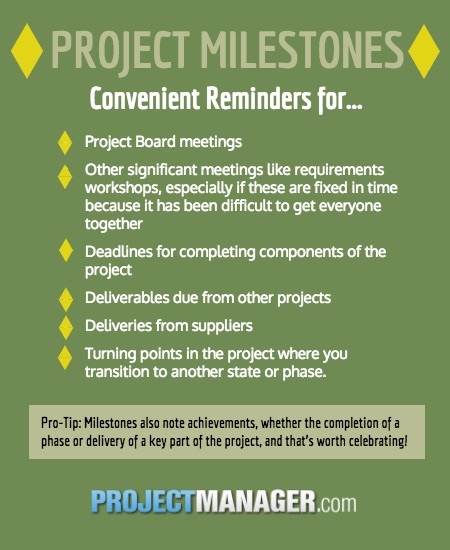 You don’t have to use milestones on your project schedule. You could simply list all the tasks in a To Do list and work through them until the end. This might work for a small project but the risk on larger projects is that your plan becomes unmanageable and hard to read. Milestones help break up the work into manageable chunks so that you can spot the natural breaks in the project. They remind you of critical dates and they act as a great communication tool. Use your project management scheduling tools to quickly create and report on key project milestones. ProjectManager.com lets you add milestones to your plans with a single click, making it easy to identify the critical dates for the team. Try it today.